Popular video sharing site DailyMotion has been hit with the cyber attack and its been the latest victim of the data breach. The news of the data breach has been coming out after a couple of users on twitter tweeted a screenshot of the mail that they received from DailyMotion team, stating about the breach. 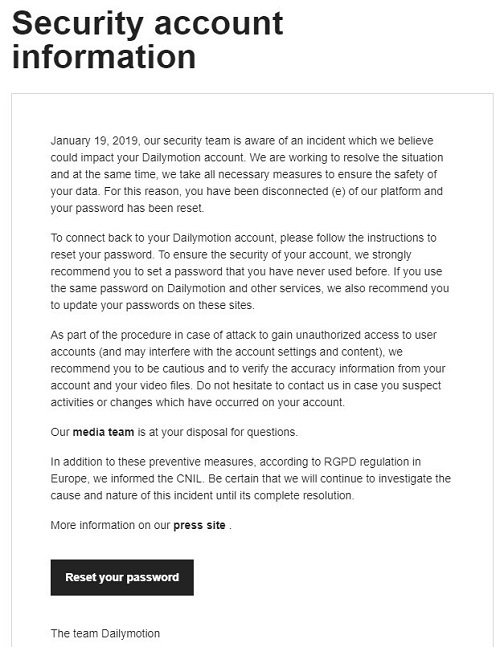 According to the mail screenshot, DailyMotion security team was aware of the breach on Jan 19, due to which DailyMotion have reset the users account password. Furthermore, they have also informed the CNIL (French Data Protection Authority) about the attack. It is unclear what count of accounts have been affected, as we haven't received any comments from DailyMotion nor seen any official notification about this breach. This isn't the first time video sharing site suffers from the cyber attack. Earlier also a couple of times service got hacked in 2014 and 2016. In 2016 almost 85 million users account details were stolen. We will update the post as we get further updates on the story from DailyMotion Team.